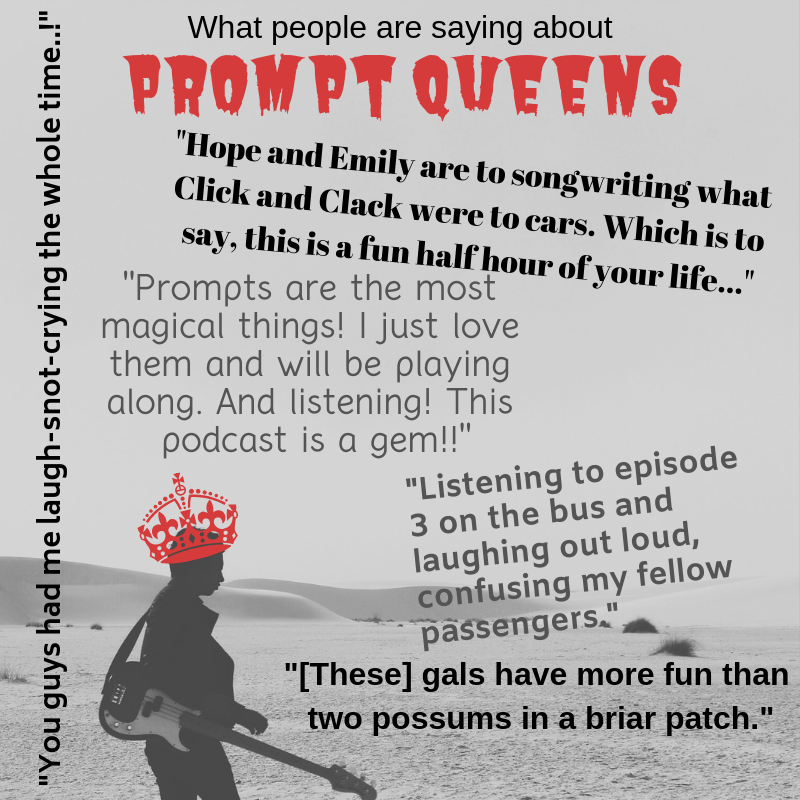 Prompt Queens is the songwriting podcast where every episode hosts Hope Dunbar & Emily Dunbar pick a prompt, write a new song to the prompt, play it, and discuss the songwriting and creative process. We also invite you to play along. We want to get you writing. Pick one of the prompts, write, and send us your song. Once we've got a sampling of songs, we'll incorporate them into an episode. The Prompt Queens experience a dark night of the soul while writing about murder, but still manage to crack each other up. Hope and Emily talk about the songwriting process, finding your writer's voice, and MURDER. We interrupt our regularly scheduled programming to bring you a special episode with teacher, mentor, friend, and writer of SEVEN number one songs Steve Seskin. Steve gave Emily & Hope the prompt I'm Not Who I Used to Be and the three discuss the songwriting process and crack wise as usual. They say good things come in threes, at least that what Hope says in her number song this week. We prove it to be true because you get THREE SONGS this episode. Emily & Hope write to the prompt: a number, and talk shop about songwriting. It's been a long, long winter and the Prompt Queens team is ready for summer. We tried to conjure it through songwriting. Hear Hope and Emily play odes to warmer weather and discuss the songwriting process. Then, write your own and send it in! Blink and you'll miss 'em! Emily & Hope write Prompt Queens theme songs. Prompt Queens is songwriting/comedy podcast. Every episode we write to a new prompt, play our songs, discuss songwriting and the creative process, and invite you to play along at home. Hosted by Emily Dunbar & Hope Dunbar.